Dairy Queen customers can Round Up for the Kids during October – Dairy Queen Corp. Participating Dairy Queen locations will be asking customers to round up their purchase to make a donation to Children’s Miracle Network Hospitals during the month of October. Round Up for the Kids is a great way to give back to the local CMN Hospital in the area and help kids treated there. Customer change gathered during October will help kids like Teddy. Teddy is an 11-year-old patient at Cohen Children’s Medical Center in New York who is treated for hydrocephalus, a buildup of fluid in the brain. The condition results in problems with short-term memory, physical deficits and other neurological conditions. But despite having 36 surgeries since birth, Teddy’s appreciation for life is unmatched and he remains optimistic and full of charm. 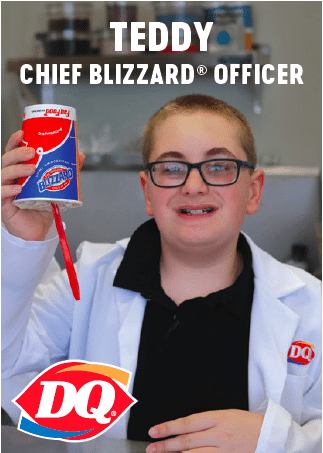 Teddy was name Dairy Queen’s honorary Chief Blizzard Officer earlier this year and this role allows him to help spread the word about how charitable funds raised by Dairy Queen’s fans and franchisees help kids just like him. Previous post: Miracles on Minnesota Ave!